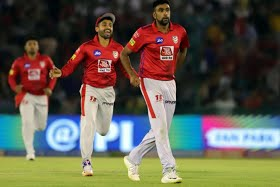 After two consecutive losses, Punjab returned to winning ways by defeating Rajasthan by 12 runs at Mohali on Tuesday. Batting first Punjab posted 182 for 6 and then restricted Rajasthan to 170 for 7. While Lokesh Rahul celebrated his World Cup selection with a half-century, David Miller contributed 40 before skipper Ravichandran Ashwin did the star turn with both bat and ball. After blasting 17 in 4 balls, he claimed 2 for 24 with the ball. Despite a half-century from opener Rahul Tripathi and a quick 33 from Stuart Binny at the end, Rajasthan fell short. “He can actually swing the ball both ways and for a left-hander to swing both ways is a massive advantage in the first six as we have seen with Deepak Chahar in the Chennai. We are looking forward to Arshdeep doing some great things in the tournament,” an optimistic Ashwin said about the youngster. Rajasthan skipper Ajinkya Rahane, on the other hand, said 182 was changeable. “We started well. Just a matter of two sixes. A game like this, you can’t criticize too much. Our bowlers bowled well. In a case like this, you can’t lose too many wickets in a bunch. “Discussion between me and Stuart was take it deep. Tripathi started really well. Should learn from our mistakes. These things happen in T20 cricket. Our two legspinners in the middle overs were brilliant. Jofra’s four overs were critical,” Rahane added.